HOWEVER much engineering development the manufacturer of an audio-frequency amplifier expends on its design, there remains the problem of comparing the performance of the quantity-produced unit with that of the laboratory model. Without rigorous inspection some defective units are likely to reach the user, which makes necessary expensive replacements and breeds ruinous ill will. Some manufacturers check the component parts before assembly and follow this with a supplementary " try-it-and-see-if-it-works " test. This, however, is only partially satisfactory because errors in assembly may still creep in and because any kind of a trial inspection requires highly-competent, specially-trained inspectors if the tests are to mean anything. 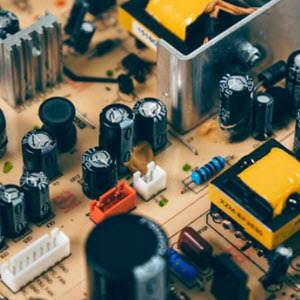 Even then, it is doubtful whether any listening test can be relied upon to detect small abnormalities in the performance of a high-quality amplifier under production conditions. Radio Company to build suitable test equipment, and the engineering departments of the two organizations collaborated on the design of the audiofrequency amplifier test set that is described here. It makes possible a speedy and accurate test and is capable of operation by an inspector with no special training. The most important characteristics of an amplifier's performance are its ability to show the required amount of gain or amplification over the desired frequency range and to deliver the required amount of power without overloading. 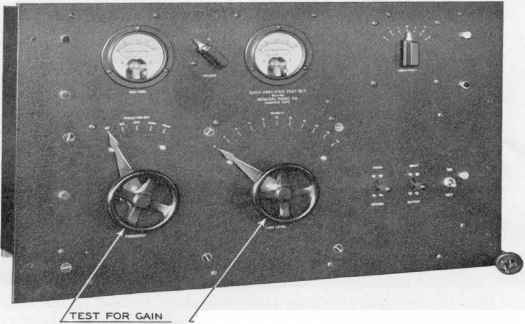 It was decided that the test of the Victor Company's amplifiers should include an accurate measurement of both these quantities. the input terminals of the network. Then, if all the terminal impedances between units in the circuit have been properly matched,* the gain of the amplifier is equal to the attenuation or loss in the network. The complete gain-frequency characteristic is obtained by repeating this measurement at as many test frequencies as necessary. The overload-level test is also based upon a laboratory method for determining where further increases in the input of the amplifier fail to produce proportional increases in the power output. The overload level is the ratio (expressed in decibels) of this power output to the standard reference level or normal test outputf of 50 milliwatts. * This requirement makes necessary the impedance Z. If the oscillator output voltage be maintained constant as shown by the voltmeter, the network behaves as though it were working out of a power source of constant internal electromotive force and internal impedance Z. See K. S. Johnson, 'Transmission Circuits for Telephonic Communication (New York: D. Van Nostrand Co., 1925), Chapter VIII, in particular. t I. R. E. Standard. See 7'ear Book of the Institute of Radio Engineers (New York, 1929), p. 107.
quencies the voltage of the oscillator is made the same by an adjustment of the respective feedback resistances. From the standpoint of the inspector using the test set, it is desirable that the power output of the amplifier be constant at every one of the test frequencies, in spite of the fact that the amplifier gain is different for each one. Then it is only necessary for him to note whether or not the load voltmeter deviates from a fixed value marked upon the dial in order to tell whether or not the amplifier is up to standard. This is accomplished by inserting enough attenuation ahead of the amplifier to make the output the same at each frequency. This is the function of the compensation network shown in Figure 2. Both the frequency change and the throwing in of the proper compensation network are made by means of the large hand-wheel at the left of the panel shown in Figure 3. An alternating-current-operated vacuum-tube voltmeter is used to measure the voltage across the load and to check occasionally the output voltage of*the oscillator. It is sufficiently sensitive to indicate deviations of amplifier gain from normal by as little as one or two decibels. The voltmeter is the one in the center of the panel. Figure 1. Schematic diagram of the test panel for making rapid measurements of gain and overload level in amplifiers output voltage begins to drop off as the test switch is advanced. In testing an amplifier under working conditions, it is merely necessary to connect it to the test panel by means of a set of flexible leads. With the overload-level switch set at zero the gain test is made at each of the five test frequencies, and, if the reading of the output voltmeter does not deviate from standard by more than a specified tolerance, the amplifier has been shown to have a gain-frequency characteristic like that of the laboratory model. The next step is to set the frequency control at some point — 400 cycles, for example -— and to advance the overload-level switch until the output voltage begins to fall off. The setting of the switch where this occurs indicates in decibels the overload level of the amplifier referred to the reference level. At the extreme lower right of the panel, next to the toggle switch for controlling the power supply to the test set, may be seen two key switches. One of these throws the voltmeter from the amplifier output circuit to the output of the oscillator for checking its voltage. Since the audio amplifier is intended for use in conjunction with a phonograph pickup (low impedance) as well as the detector tube of the radio receiver, its input circuit has a low-as well as a high-impedance winding. Gain and overload-level tests are made for each winding, and the second key switch makes the necessary internal changes in the test panel. built amplifiers were being tested, several were found to have a sub-nor-mal amount of gain in the middle of the frequency band. Checking them upon the elaborate laboratory gain-measuring set proved that the test panels were operating correctly, but the trouble could not be traced to any fault in the amplifier until it was discovered that the lower-grade wax used for impregnating the power transformers had been inadvertently used in the inter-stage coupling transformers. It is highly probable that a simple listening test would not have found the trouble, yet the accident is one that could happen in any assembly plant. By the use of the General Radio Company's test panels, the Victor Company makes its production with great speed and accuracy and with a consequently low unit cost of test. The average time necessary for a complete check is about one minute, and the amount of deviation from standard is held to a tolerance of one and one-half decibels. This test compares favorably in accuracy with the more elaborate laboratory measurements requiring considerably more time, equip ment, and technical skill. Such high accuracy is justified, for there is no excuse for the manufacturer making heavy investments in research and quality materials unless he is sure that the finished amplifier is as good as the approved laboratory model. In addition to the check upon the completed amplifier, all of the component raw materials are tested before assembly. All input, interstage, and output coupling transformers are inserted in amplifiers of known excellence which are then tested on the test panel. If the amplifier shows normal performance, the transformers are shown to be satisfactory. Ten of these amplifier test panels have been built for the Victor Company and five more are now in process. The flexibility of the test set makes it adaptable for use with almost any audio-frequency amplifier, and it may be readily altered to take care of such changes in the design of the amplifier that may be made after production has begun. The method of working out the problem is general enough to show definitely that laboratory methods can successfully be applied to production tests.